> @fahqbendover have you considered levelling you camp and survivors up so that you can go further in the challenge distance and guild wars? Yes I know this involves playing boring scavanges etc but everyone who is at end game has had to do this too. I agree, most "endgamers" have spent countless hours grinding scavenge to level up or camps and survivors. Gotta be done. For real. I don't get this mentality. All end gamers hit this wall at one point, but guess what? We grinded to upgrade our camp and survivors so we could go further and beat the distance. We didn't just buy our way there like some players would believe. We refined our strategy and tried new approaches to get to where we are now. @Fahqbendover .......Or you don’t do that. Eww. Scavenge for hours, really?! Yeah. No. The mid levels are the longest ( or from my experience they were about 35 years lol) if you were me you’d not scavenge but play the modes you actually like playing, unless you want to hate the game. If you can’t play hard distance play normal. You’ll earn bunches of supplies and xp to upgrade your camp plus when you can play with the same 3 the entire time ( and owned it ) you’re confidence will be enough to test the waters of hard mode. Play challenges for rewards and experience for strategy until you want to stop ......not a big deal. And find a guild that will allow you to participate in GW’s for your level. You don’t have to climb up hill both ways in a blizzard to end gamer it is all I’m sayin. Triple rounds should be removed completely. This thread illustrates that is (nearly) impossible to make everyone happy because different players have different priorities. I originally proposed this solution (which would make ALL players happy) in November, but it appears that it bears repeating. The Suggestion: A player chooses their starting level, with certain limitations. When a player starts a challenge, their 'recommended' starting level is presented to them. For the sake of this discussion, lets say that the suggested starting level is the level they achieved last challenge -10. So if I made it to round 32 last challenge, the default/recommended starting level would be 22. I could override that all the way down to the minimum starting level for any player all the way up to a maximum (for the sake of this discussion, let's say that the maximum is the highest round that the player 3 starred across the board last challenge -5 levels). These minimums/maximums aren't written in stone... some thought would have to be given here, but the values presented are a good starting point for a discussion. When a player chooses a starting level, they earn stars from all prior levels as if they had completed each challenge round perfectly. 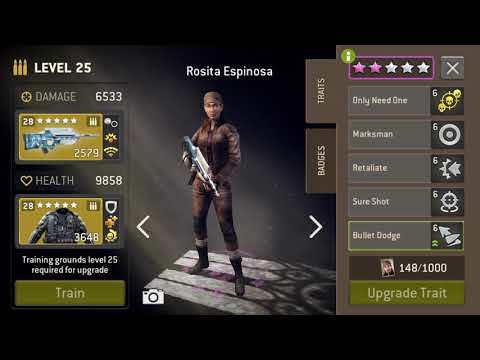 A player who plays from the minimum level all the way up to level 27 earns the same exact number of stars as someone who starts at level 27 (although the person starting at the lower level earns all the post mission crates). One of the major advantages to this model is that I can plan accordingly based on my schedule as it changes. The week of Thanksgiving is approaching and I host and so won't have much time? I want to start that challenge at the maximum level I can start at. A few weeks later, I took the week off for Christmas, so I choose to start at a much lower level because I have the time. The User Interface when staring a challenge with be similar to the round pass popup box. Instead of clicking on that 'Accept' button (or whatever that button is labeled) a player sees their default starting level and they can simply hit accept like they do today if they want to take the system generated recommendation. If they want to change it, they can... then hit the Accept button. Easy peasy lemon squeezy. Players with less time to start at a higher RSL. They sacrifice end of mission reward crates to do this. Players with more time or who want more rewards can start at a lower level. The text above that has been italicized has been updated since my original posting. So let's say i can clear 32.2 3 stars easily (I do get bruised easily on 33's). Next week I can start on 32.1 and earn all the stars up to that point including individual player rewards? And this costs no gas? Count me in! That will NEVER happen. EVER. If I get to level 33 once perfectly, then all I have to do is start there every week and not play at all to earn all of the rewards up to that point. That means NG would be losing out on many 24 hour gas booster purchases and players spending gold to heal and to buy gas if they didn't get a gas booster. Also, there would be no incentive for people to play as they could just start at the highest level and collect the rewards and log off until the next week. > This thread illustrates that is (nearly) impossible to make everyone happy because different players have different priorities. I originally proposed this solution (which would make ALL players happy) in November, but it appears that it bears repeating. > The Suggestion: A player chooses their starting level, with certain limitations. When a player starts a challenge, their 'recommended' starting level is presented to them. For the sake of this discussion, lets say that the suggested starting level is the level they achieved last challenge -10. So if I made it to round 32 last challenge, the default/recommended starting level would be 22. I could override that all the way down to the minimum starting level for any player all the way up to a maximum (for the sake of this discussion, let's say that the maximum is the highest round that the player 3 starred across the board last challenge). These minimums/maximums aren't written in stone... some thought would have to be given here, but the values presented are a good starting point for a discussion. > When a player chooses a starting level, they earn stars from all prior levels as if they had completed each challenge round perfectly. A player who plays from the minimum level all the way up to level 27 earns the same exact number of stars as someone who starts at level 27 (although the person starting at the lower level earns all the post mission crates). > One of the major advantages to this model is that I can plan accordingly based on my schedule as it changes. The week of Thanksgiving is approaching and I host and so won't have much time? I want to start that challenge at the maximum level I can start at. A few weeks later, I took the week off for Christmas, so I choose to start at a much lower level because I have the time. > The User Interface when staring a challenge with be similar to the round pass popup box. Instead of clicking on that 'Accept' button (or whatever that button is labeled) a player sees their default starting level and they can simply hit accept like they do today if they want to take the system generated recommendation. If they want to change it, they can... then hit the Accept button. Easy peasy lemon squeezy. > * Players with less time to start at a higher RSL. They sacrifice end of mission reward crates to do this. > * Players with more time or who want more rewards can start at a lower level. > The text above that has been italicized has been updated since my original posting. This points out the hazards of me updating my ideas on the fly. Instead of the maximum level being: highest round that the player 3 starred across the board last challenge, it would have to be something like the highest round that the player 3 starred across the board last challenge -5. So in your case, if you got to level 32 perfectly, you'd be able to start @ 27. I'm going to update my original post with this new text. With my updated text, the max level people could start at is 5 less than their last perfect map set. So if I got to 35, the max I could start at would be 30. Then if I just logged in to collect my rewards and did nothing else, next week, my max week would be 25. So players absolutely have an incentive to log in and keep going so they can start as high as possible next week. I'm still in favor of all maps being available at any difficulty from a range of 15-40 or whatever max is needed to make the idea work. The maps could be played in any order with difficulty changing from map to map if the player so chooses. Only one completion per difficulty of each set is needed to provide a reward but the missions can be completed for XP and post mission crates. Solves all problems since players choose their own difficulty each map and allows players on a gas booster to farm lower levels when their hospital is full from taking damage at higher levels. Can I replug my solution again as well? Absolutely - I like your suggestion quite a bit. The only reason I see mine as better/more feasible is that NG has said that Dev resources to rework something like this are scarce. If NG said tomorrow that they had dedicated Dev resources and have made solving this issue a priority, then I'd be all over your suggestion. Unfortunately that isn't the case and so I see my suggestion as the best alternative. I need something new to do now. Can we get the chapter missions reset to master level so we can play them all again and get awesome rewards like the ones similar to the GW. Add all the new walkers you have since then and add more. Believe me it will give us something to do and enjoy while on our off time. I have completed it like 3 years ago all missions in nightmare mode so give us a master level mode for those sick players that have problems excepting defeat! Well, I have all the heroes unlocked and can fight all missions with just them! Maybe I should retire all my survivors and just use heroes!!! Just a thought. Back when I first started playing NML in 2016 I was disappointed I could not fight as Daryl or any heroes but in September 2016 when heroes and traits came out that was some crazy stuff and nerfage. Well thank you NG for the great ride now back to retirement. Will drop you level 40+ videos from time to time along with my 2 cents, so all my haters can eat pop corn and give me suggestions. Team Work, makes the Dream Work. We did it baby!!! > Can I replug my solution again as well? > All hail MASTER STAGE! I was going to bring up your solution cause I personally liked it the best when you suggested forever ago. > > Can I replug my solution again as well? > > All hail MASTER STAGE! > I was going to bring up your solution cause I personally liked it the best when you suggested forever ago. They did site the excuse of dev time etc as a reason. But honestly, it can't require much? It's hardly like creating a whole new game mode or missions? Master Stage is still, by far, the best proposed solution for both players and NG. Not really. It doesn't shorten the Challenge up that much, especially when compared to the current format. People fall in love with a certain idea, but when the numbers are run you can see there is little benefit in going to that format. I think it's a waste of developer time to have an end result that is nearly identical to what we have now. You have to take into account that ending the grind is a bad thing for NG. The more players they have online 24/7, the more they are willing to become addicted and spend money. Also that factor is important for investors. So, considering that, I think it's far better than any placebo-like changes we have had previously. > Not really. It doesn't shorten the Challenge up that much, especially when compared to the current format. People fall in love with a certain idea, but when the numbers are run you can see there is little benefit in going to that format. I think it's a waste of developer time to have an end result that is nearly identical to what we have now. > You have to take into account that ending the grind is a bad thing for NG. The more players they have online 24/7, the more they are willing to become addicted and spend money. Also that factor is important for investors. > So, considering that, I think it's far better than any placebo-like changes we have had previously. Which is exactly why the solution I proposed is better, so thank you for providing support for that. In my proposal players would have access to all maps at all difficulties and they could be completed in any order. So do the hardest possible missions first until you have a full hospital and then go back and complete the easier missions where no damage is taken. With current setup and with Master Stage players complete missions sequentially so there is nothing to do Challengewise but wait for hospital to clear when missions become too difficult. And I'm not sure what you mean by "placebo like changes" because it is factual that players are playing less rounds each week with the current Challenge format assuming they always finish at the same difficulty. The nice thing about numbers is that they don't care about people's feelings and whether or not you personally can interpret them. It was meant for every player, every week, to manage their own grind. Some like the grind. Some hate it. My goal was to please both. end of the triple rounds, or start challenge at a higher level. What if... you could buy Teleport in NML shop to skip first 15 rounds of challenge (in addition to round passes) or to start challenge from fixed difficulty level e.g. 32, with all stars and rewards from skipped levels of course. > For real. I don't get this mentality. All end gamers hit this wall at one point, but guess what? We grinded to upgrade our camp and survivors so we could go further and beat the distance. We didn't just buy our way there like some players would believe. We refined our strategy and tried new approaches to get to where we are now. Lol... now where are we? 25's right? We need to throw support behind Bill ZRT and Atlas working with the NG Dev team on a viable solution before more players drop. I think the ideas being proposed by these fellas are the best ones. To be honest, I never paid attention to it because I was maxed out for quite a while now but is it normal that I don't find ANY tomatoe crates in challenge missions?!? When you got maxxed out of tommys, over months, the NG brain is searching for another way, to gain real money. This NEW MAGGIE... Musket ? You can get both for some RP`s or ? MOney ?